kitty kirby's. . Wallpaper and background images in the Kirby club tagged: kirby. 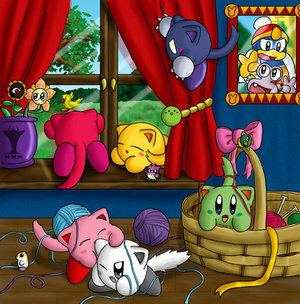 Cool, I see Rick the mouse, Lovely, the mother bird of Tokkori, and Kine all hidden in the picture as well as a HNM vase, King Dee Dee Dee, and Escargon, and Tokkori, and 6 kitty kirbys, and Whispy Woods (or an apple tree). OH MY GOD!!!!!!!!!!!! JUST PRESIOUS!!!! THE CUTENESS IS MAKING ME DIE SOO CUTE ITS AWESOME KITTYS!! !